Featuring a striking swirl pattern along with its distinctive wood grain tones, this is a 100% lovingly handmade, natural and rustic ring box. The top of the box shows off the handforged copper nail that is used to swivel the box lid 360 degrees. 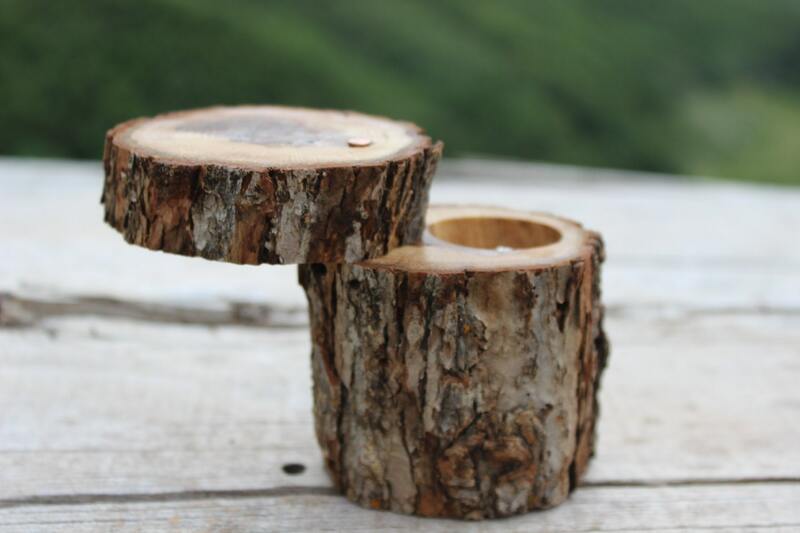 Hand cut and collected from dead standing trees in the Colorado Rocky Mountains, this box is made from oak. The outside of the box is left natural, displaying its organic character with various species of lichen and elemental wear patterns of the bark. 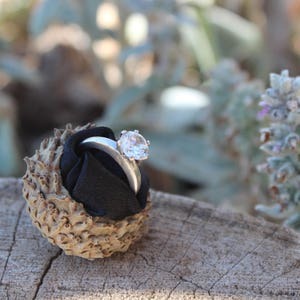 Inside, you will find a special fabric pillow cushion designed to not only protect your ring, but to provide a beautiful presentation of your jewelry. 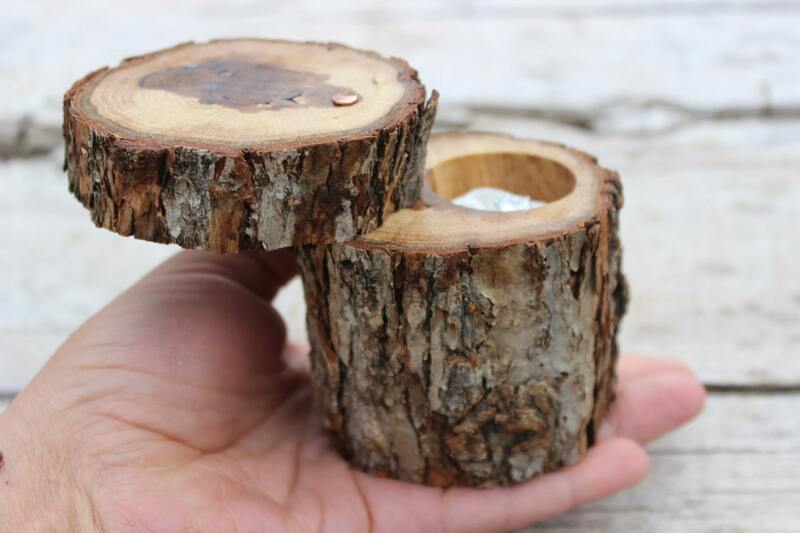 This ring box is just waiting to set a romantic woodland scene for holding your engagement or wedding ring. 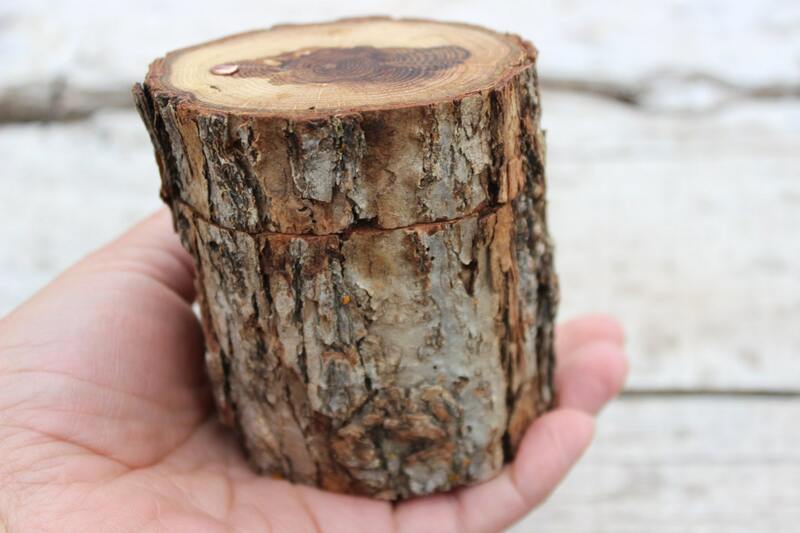 Perfect for adding a layer of natural and organic decor to your special day - you will treasure this ring box for years to come. 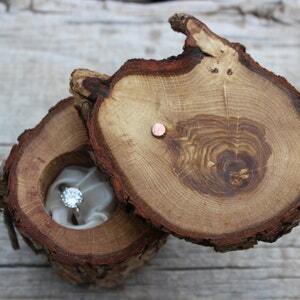 You will receive this exact unique piece...each ring box is different, just as nature intended. 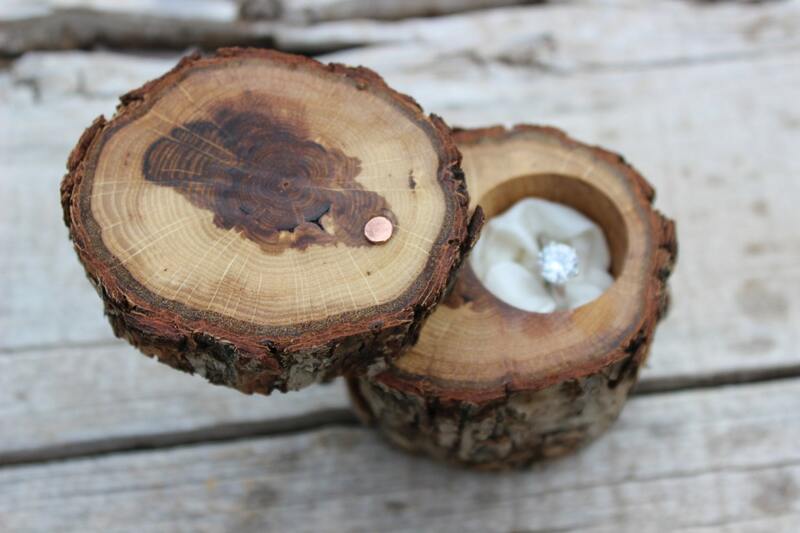 GET CREATIVE...WANT YOUR RING BOX PERSONALIZED? I will nail a copper disk with two handforged copper nails into the top of the wooden lid. Custom options may include you and your partner's initials, a heart and your special date hand stamped into a copper disk. Be creative! WANT A HANDMADE COTTON GIFT BAG FOR YOUR RING BOX? 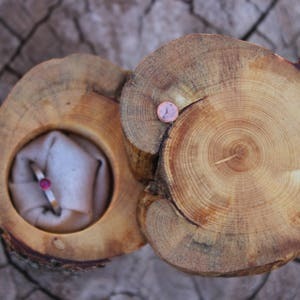 Present your wood ring box in a beautiful handmade cotton drawstring gift bag! Each cotton gift bag is custom made to fit each ring box in our shop. Perfect for a proposal, engagement, wedding day, wedding shower or anniversary celebration...add this item to your cart for the perfect accessory to complete your gift giving experience! 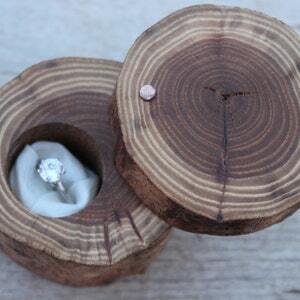 The photos you are viewing are of the exact ring box you will receive. USA CUSTOMERS: Your handmade ring box will be carefully packaged to ensure that it arrives in great condition. Please note that some bark from the exterior of the wood will slough off during shipping. We will ship your ring box via USPS Priority Mail (2 - 3 business days) anywhere in the United States. In a rush?...You will have the opportunity to select an overnight shipping upgrade at the time of check out as well. INTERNATIONAL CUSTOMERS: Your handmade ring box will be carefully packaged to ensure that it arrives in great condition. Please note that some bark from the exterior of the wood will slough off during shipping. The current shipping price listed is an estimate for First Class International Mail which is 2 - 4 weeks delivery time. In a rush?...You will have the opportunity to select a faster shipping speed at check out. 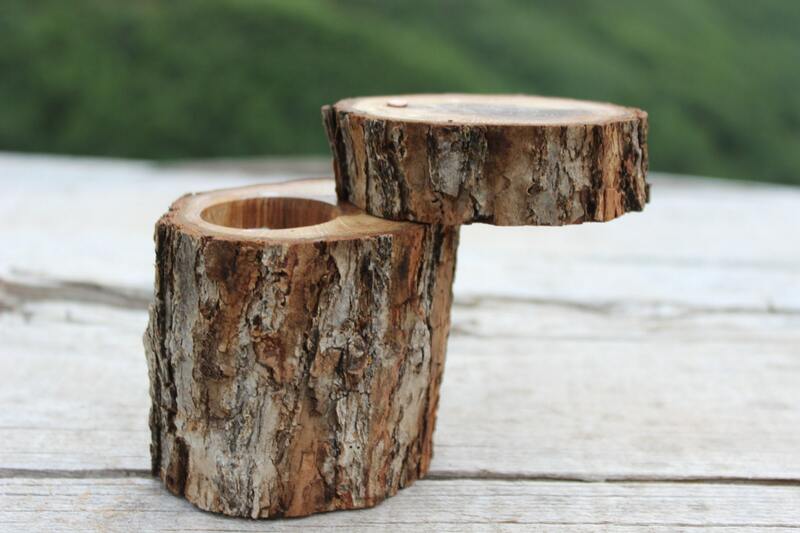 From our home to yours, these special ring boxes were handmade to uplift your spirit with the positive energy found in nature. Thank you for looking at MountainUrsusDesigns!